Click on the poster to enlarge it. Welcome to the 5th International "Treebanks and Linguistic Theories" conference! (Dec 2) The conference is over. Big thanks to all presenters, authors, reviewers, editors, session chairs, and the audience - they all are, after all, the most important for any conference's success. And thanks to Anna Kotesovcova and the other "locals" who hepled to make it as smooth as possible and an enjoyable experience! (Nov 1) WiFi access installed to the lecture room! 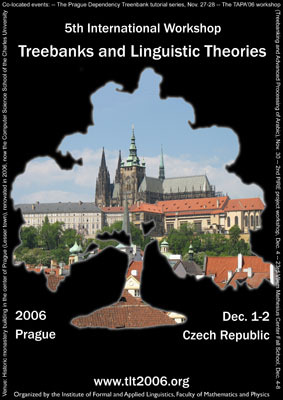 TLT 2006 will be held in Prague, Czech Republic, Dec 1-2, 2006, with a number of co-located events surrounding it (separate registration required).